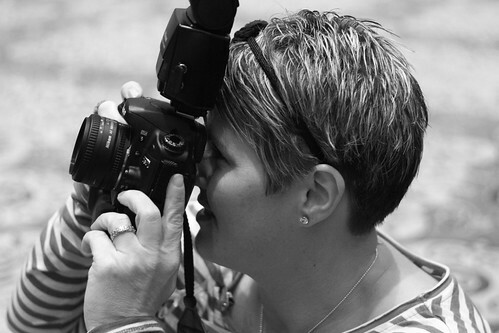 For the second post in our “My Camera” series, Julie, from Angry Julie Monday, shares about her experiences with Nikon DSLRs. 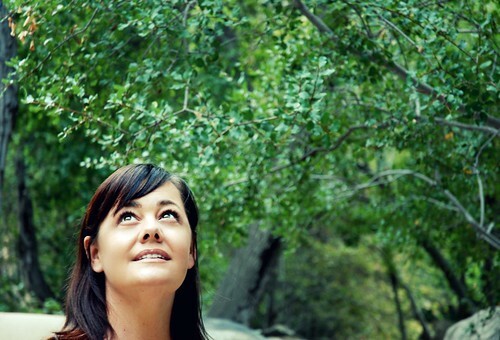 Julie is a fantastic photographer and an awesome friend! I adore her — and don’t be scared. She isn’t really that angry! 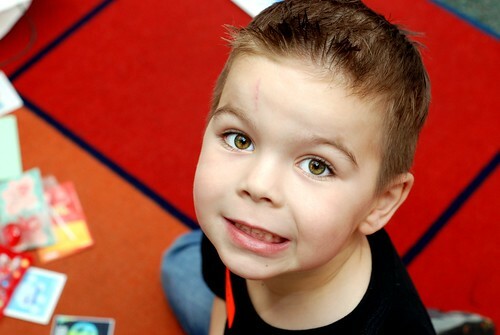 My son is in kindergarten and will be six in May. He has been my photo muse since birth. He is getting tired of smiling for me. So when I ask him to smile, he makes odd faces now. Someday, he will be asking me to take his photo again. Today is not that day. In the Fall of 2009, I began talking to Tiffany on Twitter. We have many things in common including the year we were born, wedding dates, hyperemesis during pregnancy, and raising an only child. 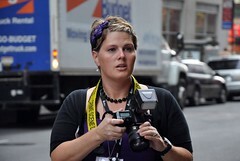 I’ve attended and photographed three of Tiffany’s Bloggy Boot Camps. I work in law enforcement and use a camera daily in my job. When I switched to this career in 2002, we used 35mm Nikon F100 SLR cameras. Every photo I took was a mystery until the negatives were processed and the photos were printed. In 2005, a few months before having our son, we invested in a Nikon D70 DSLR. It was my first experience with a DSLR camera. I had no clue on what I was doing, but my photos were crisp, and the quality was much better than the small pocket digital cameras that I had been using prior. After my maternity leave was over, we transitioned to the Nikon D70 at work. Because I used a DSLR at work, forty plus hours a week, I got comfortable holding the camera and playing around with it. In 2008, I sold my personal Nikon D70 to B&H Photo for a few hundred dollars. I downsized and bought a Nikon D60 to replace it. I wanted a new DSLR, but something that was more compact. My son prefers being behind the camera, rather than in front of the camera. 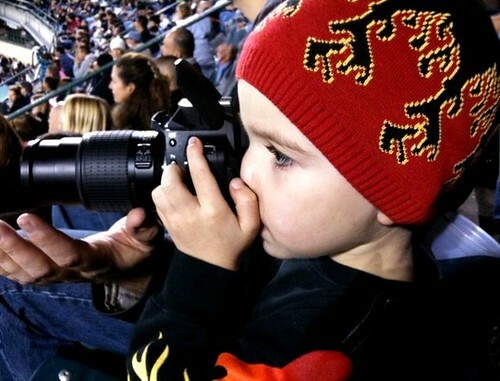 He borrowed my Nikon D60 last year when we were at the Monster Jam show. The Nikon D60 is a smaller and lighter DSLR, perfect for a four year old’s hands. He was four at the time of this picture. I use a Nikon D80 DSLR at work now, and also use it on the weekends for practice sometimes. After a few years, I have realized that the Nikon D60 has a huge crop factor and that I need a full frame camera. I was a using the Nikon D80, a 50mm f/1.8D lens, and a SB-800 speedlight in the photo captured above. I just received the 50mm f/1.8D as a gift for Christmas and I love it. I take photos every day of the week. I’m always trying to learn something new. When I’m not photographing my son, or at work, I’m probably attending a blog conference. In 2010, I attended six blog conferences, and took photographs at most of them. I love seeing the photographs that I took pop up on other bloggers Facebook or Twitter accounts as a their profile photo. It always makes me smile. I also like taking photos of Janice, because she always poses for me. Maybe someday, Janice and I will actually get a picture of us together. I am yearning for a new camera right now. 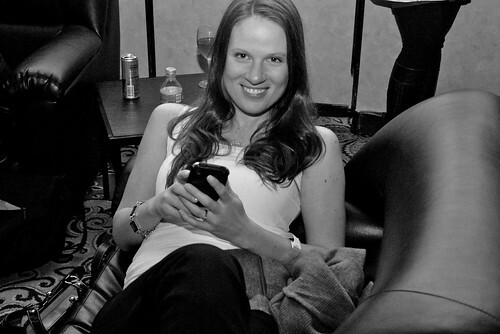 I had way too much time at Blissdom last month to covet other people’s fancy cameras. I am either leaning towards the Nikon D700 or D7000. I think that the D700o is more towards my price point, but a girl can dream, right? I’ve acquired some photo equipment along the way and I thought I would share my loot. I use all of this equipment daily, well at least weekly. Great post, Julie! Wonderful article! Great work Julie! The Nikon D700 is pretty awesome – the images from it are amazing! It’s what my husband and I currently use at our studio. At home I have one of our old studio cameras, a Nikon D2X, and while the images don’t have even close to the same detail as the D700, I still love that camera. I think it’s the titanium body. I know I can drop it on a concrete sidewalk (I have …) and it will still be ok! Your photos rock Julie. I wanna be like you when I grow up! 😉 I need to get a 50MM lens, maybe for my birthday next month. I use a Nikon D5000 and I love it! Great photos! M y husband wants to get into photography again when he retires in a year or so. Thanks.